The BJP’s new manifesto outlines a vision that is largely consistent with post-2014 trends in Indian foreign policy. 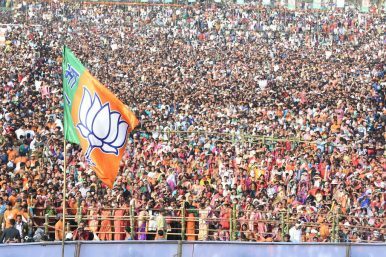 India’s ruling Bharatiya Janata Party (BJP) released its manifesto for the 2019 Indian general elections, which will begin next week and run through May 19. The release comes a week after the Indian National Congress, the main opposition party, released its manifesto document. Rajnath Singh, a senior party leader, underscored that the manifesto laid out the party’s vision of a “New India.” While the BJP’s manifesto focuses overwhelmingly on domestic issues, it outlines priorities for Indian foreign policy should it form another government. The foreign policy priorities in the manifesto largely represent continuity. The BJP manifesto underscores that India should continue to “safeguard ‘global commons’” and “strengthen our role as ‘first responder’ for disaster relief and humanitarian assistance and develop partnerships for disaster resilient infrastructure.” Over Modi’s five-year term, the Indian Navy has deployed to evacuate civilians from Yemen and bring urgent assistance to countries along the Indian Ocean littoral, most recently in Mozambique. The party’s manifesto emphasizes the importance for India to interact with Indians and people of Indian origin abroad. The Modi government has focused on outreach to the Indian diaspora and the BJP’s manifesto reflects that priority. The document notes that the Party will support the launch of a campaign known as “Bharat Gaurav” to facilitate official engagement with the diaspora. The BJP’s manifesto also draws attention to India’s efforts against “global evils, such as terrorism and corruption” at international institutions, including the United Nations, the G20, the BRICS, the Shanghai Cooperation Organization, and the Commonwealth. Reflecting developments since the release of its 2014 manifesto, the document underscores India’s interest in “ensuring an open, inclusive, prosperous and secure Indo-Pacific.” The document also underscores India’s interest in a permanent seat at the United Nations Security Council. More than 900 million eligible voters will elect lawmakers to the Lok Sabha, or the lower house of India’s bicameral parliament.